1) Factors affecting thermal distortion of welding. Thin sheet component generally refers to workpiece generated by welding steel plates that are less than 4mm thickness (including stainless steel plate, galvanized sheet, tin), for example, the roller rig hangar, driver chamber, excavator driver chamber produced by our factory. 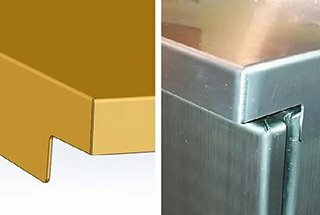 To control and avoid welding distortion of thin sheet composite require high techniques. Below are discussions based on our consensus and are for reference only. Arc welding is an uneven rapid heating and cooling process where distortion may be occurred in or after welding. The most fundamental factor affecting the welding distortion is the thermal distortion and the rigid condition of the welded component. The thermal distortion in the welding process is restrained by the rigid condition of the component, and the compressive plastic distortion occurs, resulting in the welding residual distortion. Different welding methods will produce different temperature fields, forming different thermal distortion. 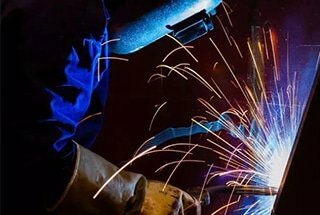 In general, automatic welding is more concentrated than manual welding, which is narrow and less deformed. With thin wilding wire, high current density, heating concentration, CO2 gas shielded welding causes small distortion. Namely, welding current, arc voltage and welding speed. The larger the line energy, the greater the welding distortion. The welding distortion increases with the increase of welding current and arc voltage and decreases with the increase of welding speed. In the three parameters, the influence of arc voltage is obvious, so the automatic welding with low voltage, high speed and strong current density causes small welding distortion. Welding seam amount and cross-section size. The more the welding seam, the larger the cross-section size, the larger the welding distortion. As continuous welding and intermittent welding generate different temperature fields, thermal distortion is different accordingly. Usually, continuous welding distortion is large and the discontinuous welding distortion is minimal. Thermal physical properties of materials. Different materials have different thermal conductivity, specific heat and expansion coefficient, resulting in different thermal distortion and welding distortion. The size and shape of components. As the rigidity of the component increases, the welding distortion becomes smaller. Using tire clamp can increase the rigidity of the component, thus reducing the welding distortion. The assembly welding procedure can cause the change of rigidity and the center of gravity position of the components in different assembly stages, which has a great influence on the welding distortion of the control components. In general, under tight conditions, welding components have large welding distortion and vice versa. The welding distortion of any steel structure can be divided into overall distortion and partial distortion. Overall distortion refers that after welding, the size or shape of the component changes, including the longitudinal and transverse shrinkage (total size reduced), bending distortion (hogging and sagging), distortion and so on. Partial distortion refers to the distortion in certain areas after welding, including angular distortion and wave distortion. The thermal distortion and the rigid condition of welding components during welding are two main factors that affect the welding residual distortion. According to these two main factors, welding residual distortion is inevitable, that is, it is not possible to completely eliminate welding distortion. 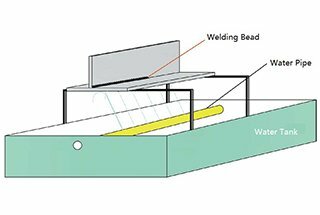 To control welding residual distortion must be taken from the design of thin sheet component and construction techniques at the same time. When design thin sheet component, in addition to meet the strength and usage performance, the minimum welding distortion and the minimum labor working hours must be met as well. Therefore, it is very important to optimize the layout of slab joint. Technique properties are often less considered when designing the layout of slab joint, which can easily cause the welding distortion. The welding process is one of the important processes in steel structure construction. 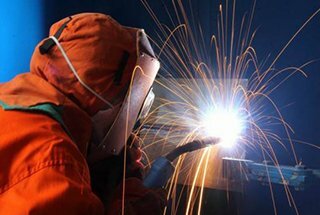 The reasonable welding process is an effective method to reduce welding distortion and reduce stress concentration. To avoid the distortion and excessive bending distortion after welding, the welding seam layout of the parts should be symmetrical or close to the neutral axis of the cross-sections. Use wide and long steel plates as much as possible or reduce the number of welding seams, etc. 1) Assembly components without assembly stress. 2) Using automatic welding and other gas shielded welding technology; for example, the most advanced Ar+CO2 mixture gas MAG protection welding. 3) Reasonable selection of welding specification parameters and assembly welding sequence. Reduce weld wire supply, reduce current, voltage, change polarity (usually dc reverse polarity, dc positive polarity). Weld the short seam first and then the long seam, take the step backward welding, from the inside out. 4) The rigidly fixed method and the anti-distortion method can be used reasonably. 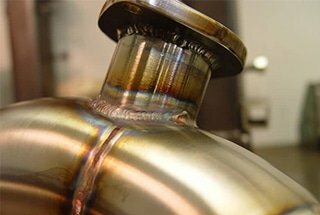 In forming steel structure, although measures are taken in terms of component design and construction techniques to control the welding distortion, because of the complexity of welding and construction techniques, welding distortion is still inevitable, therefore, the welding distortion that beyond the design requirements must be rectified. Rectification is limited to rectify certain distortion of welded components, such as the angular distortion, bending distortion, waves distortion, etc., for the overall distortion of the component, such as longitudinal and transverse shrinkage (total size shorten) can only be compensated with blanking or assembly allowance. Adopt mechanical rectification to rectify steel structure is easy to cause the metal hardening, consume a certain amount of material reserves, so it is only suitable for materials with good plasticity. In the actual production, mechanical rectification may use large-scale hydraulic press and friction press. When using flame rectification to rectify steel structure, after cooling, the welded metal part will have irreversible compression and plastic distortion, so that the whole welded component distortion can be rectified. Flame rectification method also consumes certain plasticity, so more consideration should be taken when using it for brittle materials or plastic materials. The temperature of flame heating should be properly controlled because the too high temperature will reduce material’s mechanical properties while the too low temperature will reduce the correction efficiency. As the cooling speed has no effect on the correction effect, in the process of construction, water is sprayed for cooling while heating, which improves the working efficiency and improves the rectification effect. To sum up, in the producing steel structure, the welding distortion is inevitable, which can only be controlled by taking effective methods and measures and be rectified in terms of welding distortion that beyond tolerance requirements. In this way, both quality of steel structure and economy requirement can be reached.